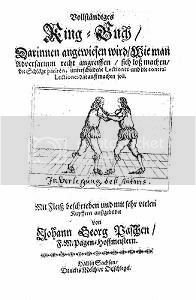 This is an interesting little 17th century wrestling manual, with focus on unarmed defence, and surprisingly complete in the types of techniques covered. It is also boringly repetitious and the explanations are not extraordinarily clear. The clarity is not improved by a paragraph numbering scheme that doesn't match the picture numbers, and the hard to read, fraktur-style typeface. I have omitted the paragraph numbering as I found it more confusing than helpful. The original has the pictures grouped, I have placed them with the relevant paragraphs. The work is divided in a first part, an other part, and a third part, for no obvious reasons. Most techniques have an inwendig and auswendig variant, the illustrations annoyingly show left and right versions for one variant, but don't show the other variant at all. I have translated these terms as inwards and outwards, for lack of better alternatives. Inwendig seems to mean mostly that the technique happens between your or his arms, and auswendig, outside of the arms, sometimes auswendig seems to mean from the center outwards, though, so the terms or at least my translation is not very consistent. I left the latin words like Adversarius (opponent) from the original. This translation is based on the version included in "Chronik alter Kampfkunste", Weinmann, Berlin, 1997 (isbn 3 87892 031 8). My notes are in square brackets [like this]. This translation is dedicated to the virtue of generosity. Wherein is shown how to correctly come to grips with Adversarium, to get free from holds, to parry blows, different Lectiones and the contra-Lectiones that apply to them. Wrestling ['Ringen'] is a useful exercitium, and well-known history shows that it was practiced by our forefathers not only for fun, but also in earnest, because it not only improves the condition of the whole body, but so also a weaker person can, by knowledge of this science, and fully trained therein, defend himself against a stronger one, and resist him. As high as it was esteemed by our forefathers, so little is it known in our time, and these days everyone relies on their size and strength, yet they feel in danger when confronted by a smaller man trained in wrestling. These circumstances have prompted me to bring some things to light in this print and coppers. Do not hesitate, lovers of wrestling, to willingly accept this little work by me, which I place in God's care.